Landmannalaugar is a rhyolite volcanic area in the Torfajökull Caldera, exceptionally rich in colours which vary from green, yellow, blue and purple to pink, brown, black and white. The name refers to the hotsprings you find scattered around here, pools that have been used by the people of Iceland for centuries. Landmannalaugar is a part of the Fjallabak nature reserve, and we will spend approximately 2 hours here. 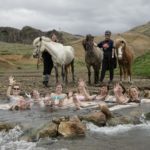 ​On our Landmannalaugar tour we pass through the fertile and cultivated southern countryside and the historical Þjórsárdalur. 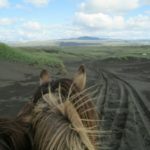 We will see a variety of craters and volcanoes in a moon-like landscape, and drive on mountain trails through the recent ash, pumice and lava fields created by the most famous and active volcano of Iceland, Mt. Hekla. 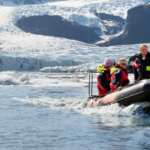 ​An unforgettable 4×4 Super Jeep Excursion in to the interior of Iceland. Route may vary due to season, road, snow and weather conditions. English speaking driver guide, other languages on request. Good shoes, warm wind- + waterproof clothes, sunglasses. Swimming Gear. Use of soap in the pond is not allowed. Departures from hotels outside Reykjavík on request.